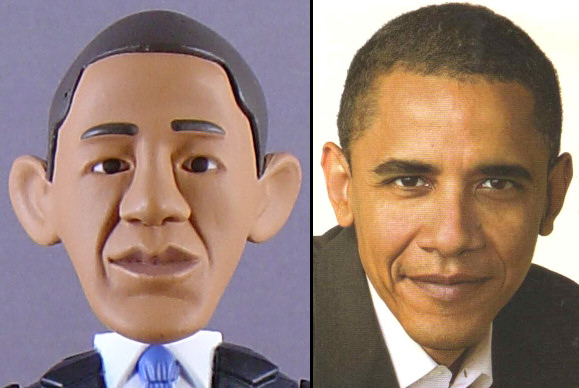 Scary-Crayon reviews... the Barack Obama Action Figure!!! Generally speaking, I tend to avoid more serious content on Scary-Crayon. Sure, some of our reviews and comics have criticized or mocked various aspects of American culture and traditions -- for example, I went after Black History Month on three separate occasions, commented briefly on post-9-11 racist paranoia in my lengthy and rambling Flightplan audio review, and skewered the vapid interests and concerns that women are encouraged and expected to adopt have come up in print analyses of Cosmopolitan. But in all of these cases, the criticisms have been somewhat reserved: using media as a context for discussing these issues yet never fully plunging into the more significant subjects (extended blog commentaries aside). If I'd intended for the site to focus heavily on that sort of thing, I would have christened it "Sophisticated-Quill-Pen." If I recall correctly, Scary-Crayon's only overtly political article was posted the day before the 2004 presidential election -- and considering that it was really a comparison the merits of monkeys and zombies with reference to various films, it's fair to say that we've never had any true political articles on the site. That's not about to change with this piece. I don't intend to explain at length my reasons for supporting Barack Obama this year -- suffice it to say that I agree with Obama and the Democrats on pretty much all of the issues that concern me -- but I will say that I've found this election season and Obama's candidacy to be particularly intriguing and inspiring. 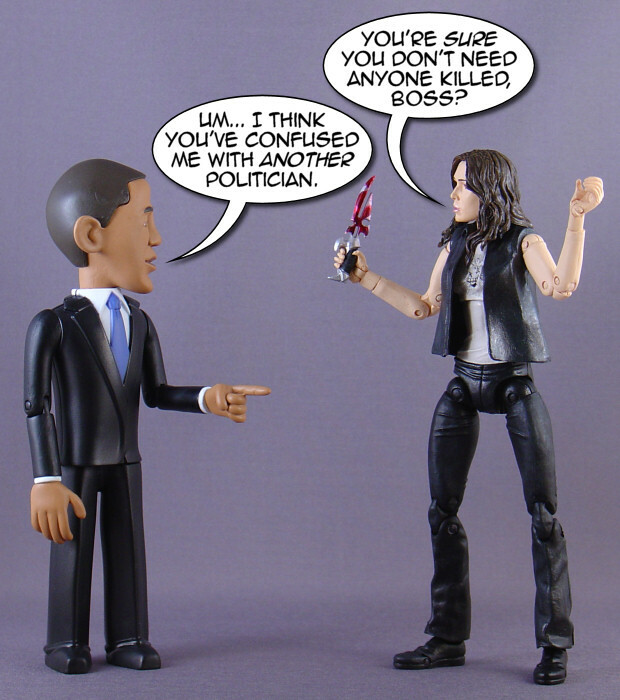 So when Jailbreak Toys released the Barack Obama action figure, I just had to order one. So here's the figure. For the mint-in-box crowd, tiny Barack comes in a collector-friendly windowed box, with the figure visible from the front alongside a drawing of half of Obama's face. (Or is it a photograph with some photoshop effects applied?) On the back, there's a nifty drawing of Obama leading an angry mob against the vampiric Republican scourge, though admittedly the large gap between the "Obama" text and the drawing itself means that the image isn't quite as attractive as it could have been. The box's muted colors also kinda diminish the excitement that the package might otherwise convey, but in a sense I suppose that's appropriate. Obama may be an inspiring speaker and politician, but he's not Captain Jack Harkness. 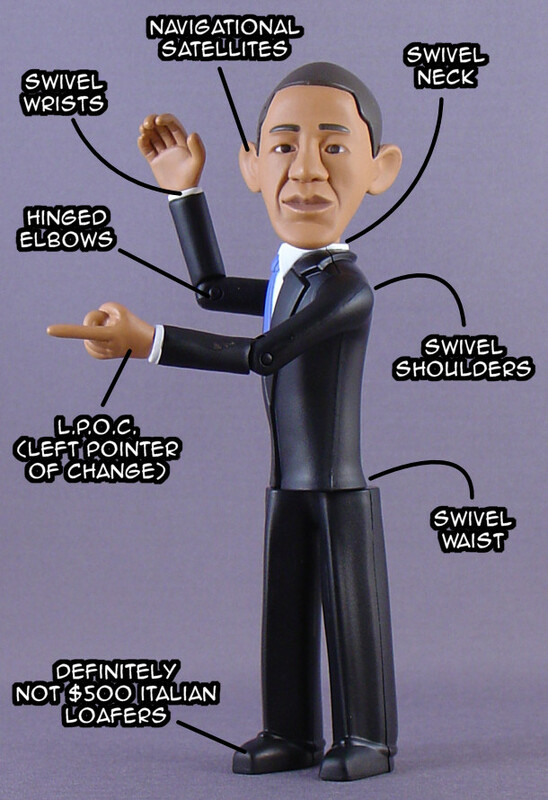 Once removed from the box, the 6" Barack Obama figure is sort of a what-you-see-is-what-you-get deal: he meets expectations for a novelty item but doesn't really exceed them. The paint is minimal but acceptable (though there's a bit of brown slop on the left forearm and the edges of the shirt and tie have that not-quite-so-crisp spraypainted look), the articulation doesn't contain any surprises, and the caricatured likeness, while fairly good, doesn't seem more or less impressive upon a closer look. The only really thing that really stood out about the figure is how light it is, as the leg and torso pieces appear to be completely hollow. 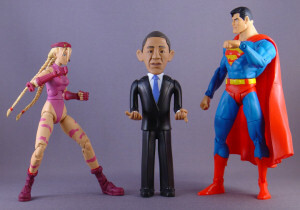 I can almost hear the PUMA and Republican crowd remarking, "See, Obama really is an empty suit!" 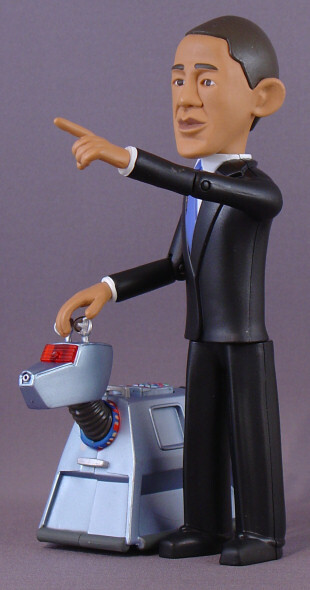 Ultimately, the Barack Obama action figure amounts to little more than a bobblehead without the bobble. He's a fun novelty item, but he's not a very exciting action figure. 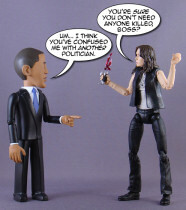 At $12.99, Obama's not cheap either; one can find far more impressive toys with more extensive articulation, detailing, and so forth in the same price range. 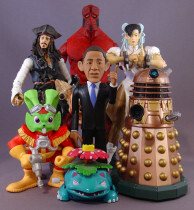 But then, the Obama figure isn't really trying to excel in those categories -- like a bobblehead, he mostly exists for supporters to display on their shelves and maybe stage goofy interactions between the next President of the United States (fingers crossed) and other figures in their collections. Chances are, if you're the kind of person to whom a Barack Obama action figure appeals in the first place, you'll be completely satisfied with this guy despite the lacking articulation and less-than-stunning value. 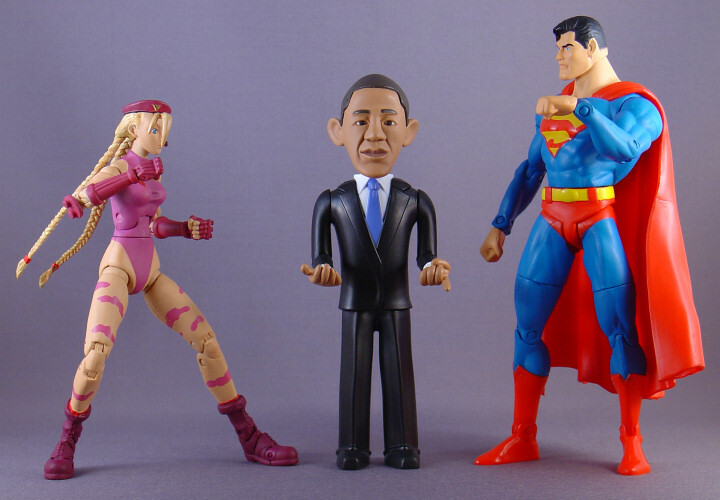 After all, the Barack Obama action figure isn't just a toy: it's a 6" souvenir from what will hopefully be a defining movement in American political history. And hey, for every figure you order from Jailbreak Toys, the company will donate $1 to Obama's campaign!